Every year or two, one of the experimental hop varieties grown by Hop Products Australia proves itself and is released as a commercial variety. The most recent cab off the rank for the Tassie-based company is Enigma, which started making more regular appearances in beers throughout 2015 (as did Melba from fellow Aussie grower Ellerslie Hop). 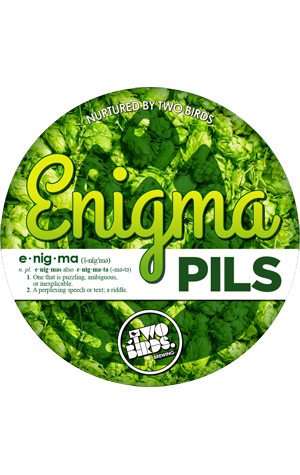 So called due to its complex and multi-faceted characteristics when used in different ways and at different times in the brewing process, Enigma showed such promise early on in the development process, which can take more than a decade, that it was moved from early trials to full commercial release in record time. Thus far, it's appeared in a number of single hop beers (presumably as brewers play around to see what potential it has), including IPAs and pilsners. And it's for the latter that Two Birds have plumped with their latest keg-only limited release, in which they plan "to showcase all that it has to offer." They reckon: "If a hop can be bright, then that’s Enigma. Bright, delicate and refined, with an abundance of finesse." In terms of what it brings to this beer, they're going with "juicy white peach, wine-like and grassy notes".